Over 30 nutrients. To help maintain health & vitality. With iron which contributes to the reduction of tiredness & fatigue. The Queen's Awards for Enterprise Innovation 2018. Gluten free. No artificial colours. No preservatives or yeast. Wellman is not tested on animals. Suitable for vegetarians. UK's No1 for Men* *UK's No1 men's supplement brand. 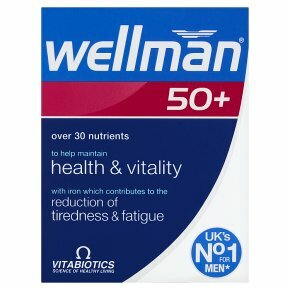 Expert support designed for men over 50 Wellman® 50+ has been designed to help safeguard the nutritional needs of men aged 50 and above. A comprehensive range of nutrients and trace elements to support key areas of health including: Active Lifestyle & Immune System Support: Thiamin (vitamin B1), copper and iron contribute to normal energy release. Plus zinc, selenium and vitamin D which contribute to normal immune system function. Heart & Circulation: Vitamin B1 contributes to normal heart function. Vitamins B6 and B12 contribute to normal homocysteine metabolism and normal red blood cell formation. Male Health: Vitamin B6 contributes to the regulation of hormonal activity. The comprehensive formula includes zinc which contributes to normal testosterone levels in the blood. With Vit. D Wellman® 50+ provides 15µg of vitamin D in the preferred D3 form. Directions One Tablet Per Day with Your Main Meal. Swallow with water or a cold drink. Not to be chewed. Do not exceed the recommended intake. To be taken on a full stomach. This comprehensive formula replaces other Wellman® multivitamins. There is no need to take an additional multivitamin. FOOD SUPPLEMENT<br>Food supplements must not replace a varied and balanced diet and a healthy lifestyle.<br>As with other food supplements, consult your doctor or pharmacist before using if you are under medical supervision, have epilepsy, a thyroid condition, haemochromatosis, suffer from food allergies, or are allergic to any of the ingredients. Not suitable for children.<br><br>Not to be taken on an empty stomach.